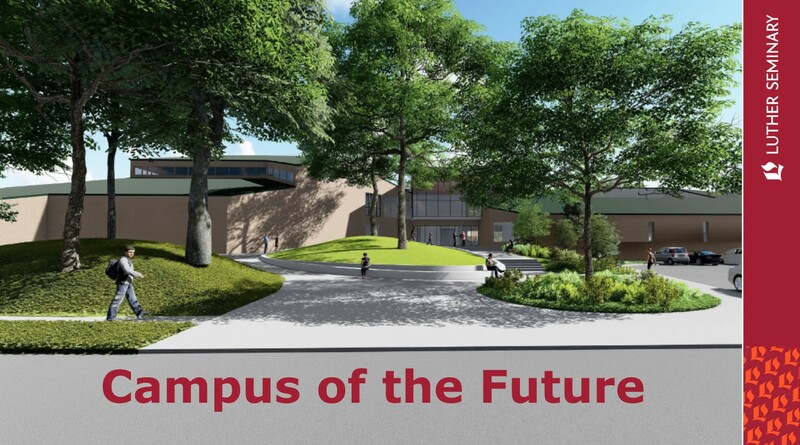 During the community forum on April 9, 2019, Robin Steinke, Michael Morrow, and Pam Beader (our owner’s rep and construction project manager) presented the latest updates on the construction plans for the campus of the future. The PowerPoint presentation they shared is available to view. As our work on the campus of the future progresses, and in keeping with the direction out of the board meeting to engage in ongoing consultation with the community, we’d like to share some updated renderings and tentative floor plans so that we can get your input and counsel on the design. Please review the information in this post carefully. Next week, we’ll host a series of input sessions where you can share questions, concerns, and ideas as we move closer to implementation of the project. On campus, input sessions will take place in OCC during lunch each day next week (Monday-Friday, February 25-March 1). For distributed learners or those unable to make it during lunch, there are two Zoom calls scheduled for Monday, February 25 and Thursday, February 28 at 7:00 PM. Use this Zoom link. While the input sessions will be the best way to get questions answered and engage in dialogue, if you’re unable to attend any of the sessions, you can also provide input on this Google form through March 1. Below, watch as Pres. Steinke takes you on a virtual tour of some of the latest designs from the architects. Explore PDF versions of the floor plans and updated renderings. These will also be available at the various input sessions. This past weekend, the Luther Seminary board of directors met and made an important decision: to move forward in our process to create the campus of the future by authorizing the sale of the lower campus and Bockman Hall–the latter of which will be remodeled and leased back to us for student housing through a master lease agreement–and renovating Olson Campus Center and Gullixson Hall as the center of our academic and community life together. The magnitude of this meeting was not lost on anyone. There were honest and heartfelt conversations among board members, faculty, staff, and students. Prayers for the Holy Spirit’s guidance were offered continually. In the video below, I recap the meeting, along with the key takeaways. Please view it in its entirety. We will vacate the lower campus, which will become a mix of affordable, senior, and market-rate housing. Master Properties will purchase, and then invest significantly, in renovating Bockman Hall into one-bedroom microapartments and studios–around 50 of which will be leased back to Luther Seminary for student housing on a master lease. 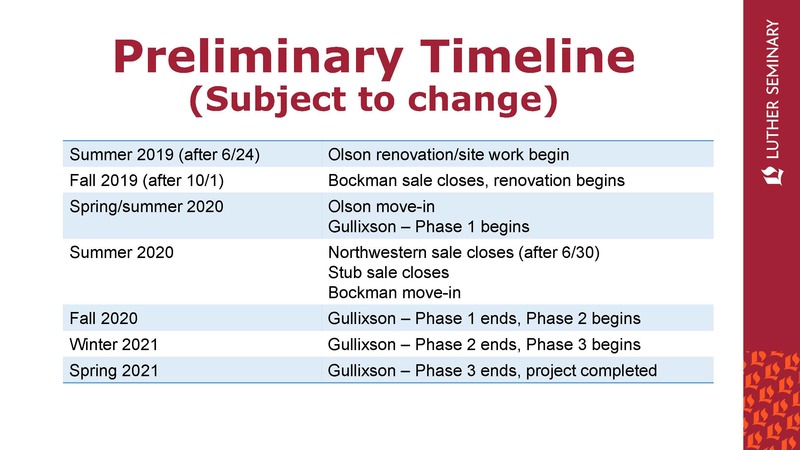 Gullixson and Olson Campus Center will be remodeled to provide fantastic spaces for teaching, learning, and community formation. We will retain the Branston Street houses. The board reaffirmed how important the integration of housing is with our curricular commitments and continued to direct us to ensure that our housing strategy aligns with our commitment to vocational formation in community. The agreement with Master Properties will include a long-term master lease for around 50 spots for students in the remodeled units. The Branston Street houses have 30-40 additional spots. This will give us a total of 80-90 housing slots under our direct control for residential and short-term housing. Establish a centralized student housing office. Hire a director of student housing. Use the next two years as a period of experimentation and study, in which a task force of faculty, staff, and students, managed out of the office of student affairs, will a) determine the best possible use of the housing units under our control; and b) explore other creative solutions, such as need-based stipends and partnerships. We are entering a season of disruption and transition. The faculty and board had a heartfelt dialogue about how physical space affects learning–and we all felt keenly that our highest priority is ensuring the quality of our students’ learning experience both during and after the transition period. To ensure all the right stakeholders are involved in the process, the board and I agree that implementation of the project must include ongoing consultation with faculty, staff, and students. Therefore, Dean Lange and I will work on formalizing a consultative process in the coming days. In the meantime, we already know we need help on a number of committees related to the transition in our physical spaces. If you would like to be involved, please use this form to let us know that you would be open to volunteering, and in which capacities you’d be most interested in serving. Michael Morrow, vice president of finance and administration, held two community update sessions in January 2019: one for students, and another for faculty and staff during the community forum. For those who were unable to make either of those sessions, you are invited to view the PowerPoint presentation Michael shared with the community. ﻿This update was sent to the Luther Seminary community in January 2019. I’m writing with an update to our campus planning process. As most of you know, in June we placed the lower campus and Bockman Hall on the market as part of our efforts to design the campus of the future. Throughout the summer and fall, we received several promising proposals. This past Friday, the board voted to move forward with non-binding negotiations with a team of developers led by Master Properties Minnesota. Master is joined by United Properties, CommonBond Communities, and Simek Realty. While entering a negotiation phase doesn’t guarantee that a deal will close, we hope to come to terms on a purchase agreement that we can present to the board for consideration during its February meeting. This development team’s proposal emerged as our first choice because of its alignment with our values and its commitment to a student housing partnership. Throughout this process we have affirmed that housing is key to cultivating the vibrant learning community we are called to be; therefore, per the board’s resolution in its October meeting, any proposal that goes before the board will be accompanied by a comprehensive housing plan. Our commitment remains to create a plan that features affordable, on- or near-campus housing for a core community of 40-50 students and retreat-style spaces for distance learners. The team of developers included several options for student housing both in Bockman Hall and on the redeveloped lower campus with their proposal, and we’re excited to flesh out the plan as we move forward. Please keep in mind that any official change of ownership would likely not take place for at least a year after a purchase agreement is signed because of the significant due diligence and planning work that goes into a transaction of this nature. 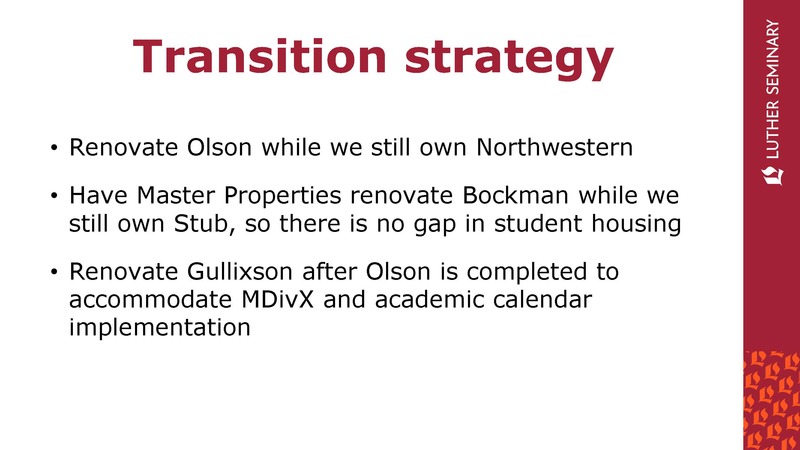 In addition, Luther Seminary has engaged a professional project management company to help us design a transition plan–including managing the student housing transition, creating a timeline for construction projects on the upper campus, and identifying temporary locations for affected offices or classrooms. We will continue to share information about these phased plans as they emerge. During the upcoming January intensives, we will hold a briefing for the entire campus community to showcase the latest developments in our schematic design process. This includes plans to transform Olson Campus Center, Gullixson Hall, and the surrounding landscape in ways that communicate our commitment to sustainability, community, and innovation through the work of the Holy Spirit. This is an exciting time for Luther Seminary. We’re grateful to be moving forward on this important process. As ever, I ask for your continued engagement and prayers. This is work we can only accomplish together. The Fall 2018 edition of Story Magazine featured an in-depth article on the campus of the future, including a behind-the-scenes look at the design and planning process. This was initially published in the community announcements. As many of you know, the Luther Seminary board of directors met this past weekend. Much of their conversation centered around plans for the campus of the future, and included some action regarding housing. In particular, the board reaffirmed the important role student housing plays in meeting Luther’s curricular commitments and fulfilling our mission and vision. While real estate transactions involve a lot of moving parts, and there are some details we can’t yet know, there are plenty of things that have come into focus thanks to the work of the housing sprint team that met this summer and the board this weekend. 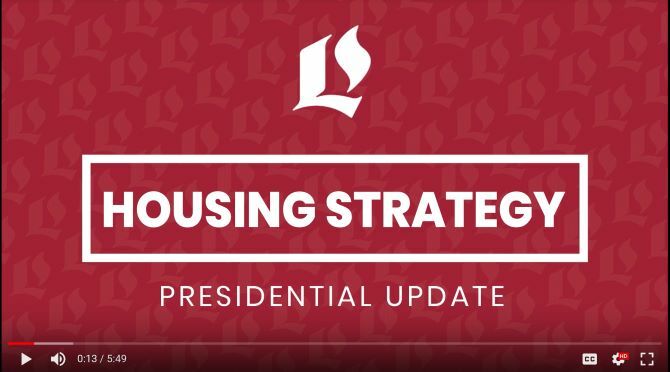 President Steinke has created a video update on the housing strategy. Please click the video image below to view it! No change in housing during at least this academic year. Establish a centralized housing office. Review all bids for campus sales. All finalists have already taken housing seriously and have included solutions in their proposals. While the specifics will depend on the real estate deal that is signed, we are committed to timing development of the buildings so that we retain usage of adequate on- or near-campus housing for residential students and swing space for faculty, staff, and classes during the transition period. Repurpose Bockman Hall for housing through a partnership with a third-party developer. Retain the houses along Branston and Grantham Streets for student housing. Explore partnerships with properties near campus for families in particular. Explore partnerships with churches for intentional living communities. Explore establishing a need-based scholarship fund for housing/living expenses. Interim Dean of Students Sarah Luedtke-Jones has been tasked with working on the establishment of the housing office, including defining responsibilities and scope of work for the office. Consult with a specialist in student housing to help refine strategy. ﻿This email was sent from President Robin Steinke to the Luther Seminary community in May 2018. As many of you know, the Luther Seminary board had their spring meeting this past weekend. Perhaps the most significant item on the agenda was a resolution to move forward with the next phase of work regarding the campus of the future. I am pleased to report that the board made the decision to commence the schematic design process using “Path B” as a starting point. This includes concentrating the work of the seminary on the upper campus and creatively reimagining the use of Olson Campus Center and Gullixson Hall for learning, teaching, collaborating, and building community. The board also directed that a specific plan to ensure affordable on- and/or near-campus housing for a core residential community, as well as retreat-style short-term lodging for distributed learning students, be solidified. Although the planning work begins now, there will be no changes in the 2018-19 school year. Northwestern and Stub Halls will continue to be operational at least through June 2019. We will continue to keep everyone up to date on the process and will share a more comprehensive timeline with the community as soon as it’s been developed. These decisions have been prayerfully and deliberately made. Each step of the way, our vision to lead faithful innovation for the sake of the Gospel of Jesus Christ has been at the core of our process. This is a significant step, but we’ve only just begun to dream about what is possible for our community. The campus of the future will require innovative, flexible, and collaborative spaces for teaching, learning, and community formation. The design will communicate the vibrant, forward-looking, welcoming energy that is central to who we are called to be. It will reflect the reality of our community’s global impact: a “hub” where Christian public leaders come to learn, grow, interact, and be formed spiritually–and then go into the world to minister, share the Gospel, and form Christian community on every continent. And we need your help. Just as the board relied heavily on input from the community to make this decision, the engagement of the community will be vital to the next phases of the process. We imagine technology for leading edge instruction throughout campus, excellent architectural design, and landscaping and green spaces that are both beautiful and sustainable. Moving into God’s future will require all of us together dreaming about what is possible and working to accomplish it. Thank you to the students, faculty, and staff for your heartfelt engagement so far, as well as the campus vision team for their leadership in this important process. Please join us as this journey continues to unfold. There is much to be done, but the future is bright, and God’s promises are sure. This is most certainly true! This microsite is here to keep you up to date on the planning process for the campus of the future. Bookmark this page for communications, updates, announcements, and more.